Chemical, physical and thermal properties of pentane, also called n-pentane. Phase diagram included. Pentane, C5H12, is a clear colorless liquid with a petroleum-like odor. It belongs to the organic class alkanes, and is naturally present in crude oils and condensates. It is a component of some fuels and is employed as a specialty solvent in the laboratory. The boling point 36°C/97°F, and the vapors are heavier than air. Both the liquid an the vapor are flammable. The phase diagram of pentane is shown below the table. Values are given for liquid at 25oC /77oF / 298 K and 1 bara, if not other phase, temperature or pressure given. as well as Thermophysical properties of: Acetone, Acetylene, Air, Ammonia, Argon, Benzene, Butane, Carbon dioxide, Carbon monoxide, Ethane, Ethanol, Ethylene, Helium, Hydrogen, Hydrogen sulfide, Methane, Methanol, Nitrogen, Oxygen, Propane, Toluene, Water and Heavy water, D2O. Pentane is a liquid at standard conditions. However, if heated above 36°C/97°F it becomes a gas, and when cooled it becomes a solid. 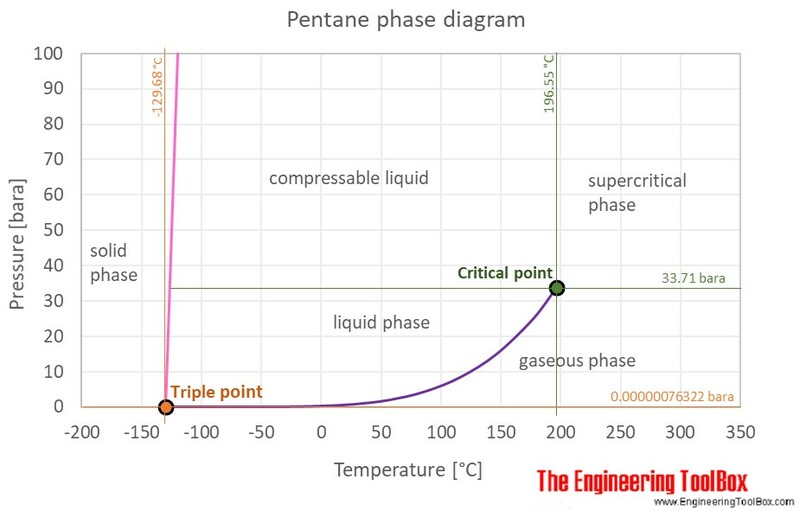 The phase diagram for pentane shows the phase behavior with changes in temperature and pressure. The curve between the critical point and the triple point shows the pentane boiling point with changes in pressure. It also shows the saturation pressure with changes in temperature. Carbon Dioxide - Thermophysical Properties - Chemical, physical and thermal properties of carbon dioxide. Phase diagram included. Ethanol - Thermophysical properties - Chemical, physical and thermal properties of ethanol (also called alcohol or ethyl alcohol). Phase diagram included. Hydrogen sulfide - Thermophysical Properties - Chemical, physical and thermal properties of hydrogen sulfide, H2S, also called hydrosulfuric acid, sewer gas and stink damp. Phase diagram included. Engineering ToolBox, (2018). Pentane - Thermophysical Properties. [online] Available at: https://www.engineeringtoolbox.com/pentane-properties-d_2048.html [Accessed Day Mo. Year].